A surprise fabric parcel arriving in the mail on Friday was definitely a highlight. I was delighted to receive these wonderful fabrics as a thank you from Susie from Flowerpress for some words of quilting advice and encouragement that I offered her earlier this year. 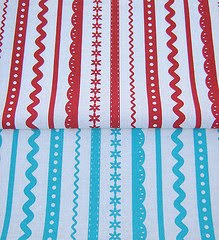 This is Susie's first yardage print, and it is called RickRack. 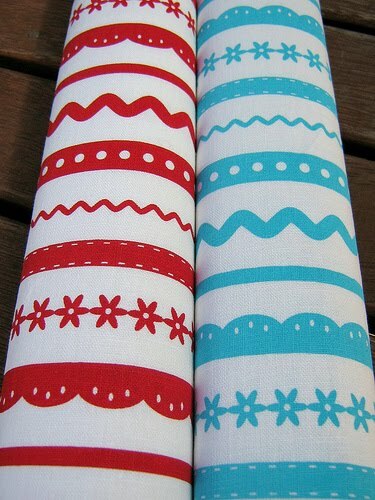 It is screen printed on a lovely mid weight linen/cotton blend (55%/40%) fabric. The fabric has a really lovely drape, it is not too heavy and not too light, perfect for quilting and craft projects, cushion covers and clothes. 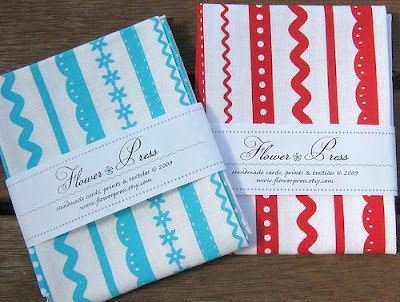 Susie is also hosting a giveaway of these fabrics on her blog - Flowerpress. Leave a comment on the Birthday GiveAway Post and you will be in the draw with a chance to stash some of these lovelies yourself. A winner will be drawn tomorrow, Monday - Sydney time. Just in case you miss out, more yardage is available in Susie's Etsy Store - Flowerpress. Before you head over, be warned, hide your credit card! There are some lovely gift ideas there, and you may even find yourself overcome with the need to treat yourself to some much deserved goodness. Thanks again, Susie, needless to say, I love them! 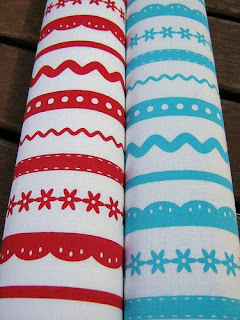 Beautiful fabrics - thanks for the link to the giveaway. How nice of her to send those to you they are gorgeous!! I am going to hop on over there right now!